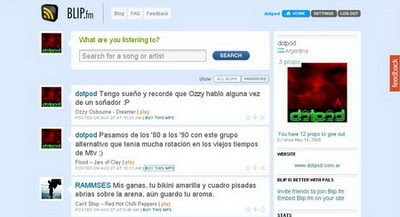 Blip.fm is a popular microblogging service that allows you to twitt your favorite songs and to establish social groups about music. Access to millions of streaming songs, your own music station, station programmed by your friends, an audience of music enthusiats, and also the opportunity to integrate it with your Twitter, Blog, FriendFeed and many other 2.0 websites. So, tell me, what are you listening to? És un servei que m'agrada força. M'hi falta la opció de fer replies directes, però està de conya, la veritat. Ah sí? Ostres, que wai! Doncs me n'alegro molt de que t'agradi!